Andy Shepard: I’m a photographer and a traveler. On November 12th, 2014 I boarded a plane from Seattle and departed on an adventure with no return date. My adventure is the places I see and go, but most of all, it is the exploration of life as a landscape photographer without an address. I’m making new images all around the world, writing about my journey, and finding new places to wander. You can find more of my work on 500px, my website, Instagram, and Facebook. November of 2014 marked my departure from home. For me, leaving Seattle was the exploration of a new adventurous mindset. My decision to pursue my landscape photography work while traveling was the catalyst for finding new, exciting experiences; experiences that would take me from the beaches of Mexico, across jungles of the tropics, to volcanic summits, and anywhere I happen to find myself with my camera and my backpack in tow. In early February of this year, I sailed into Rio Dulce, Guatemala after weeks of capturing images while cruising through the Belizean Cayes. Setting foot on land was a huge physical and mental shift from shooting primarily islands and water. I was ready to photograph something new and exciting. That’s when I heard about the eruption of Volcano Fuego just outside of Antigua, Guatemala. Only a short 12-hour bus ride away, I knew I had to get a closer look. 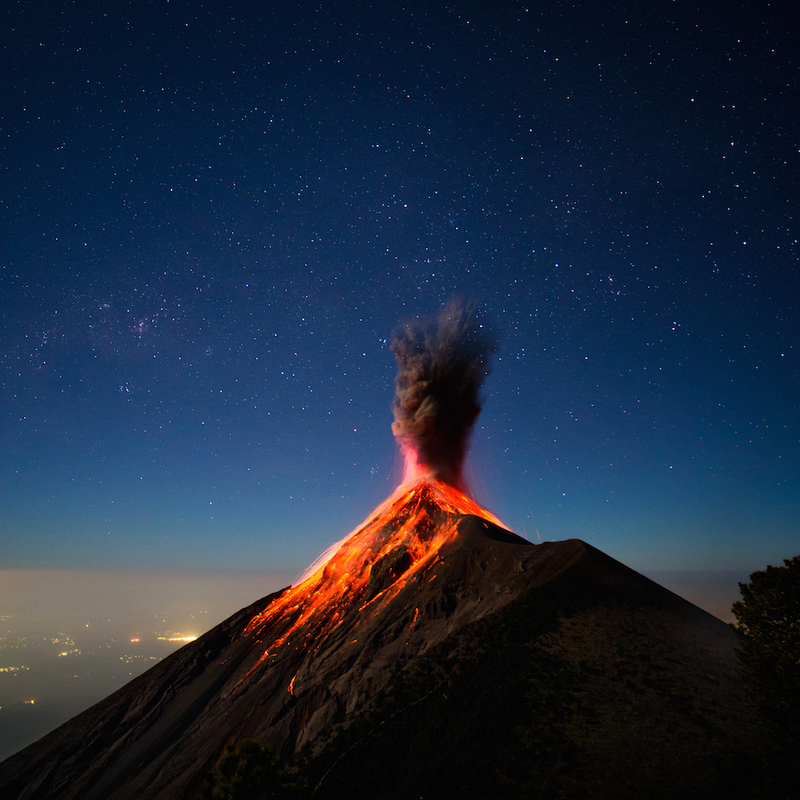 Just a few weeks later, I arrived in Antigua, Guatemala, at the foot of Volcanoes Agua, Acatenango, and the mighty Fuego. It took three days to find the perfect weather and a local guide before a new friend and I found ourselves at the side of the road on a Monday morning ready to climb a Volcano. 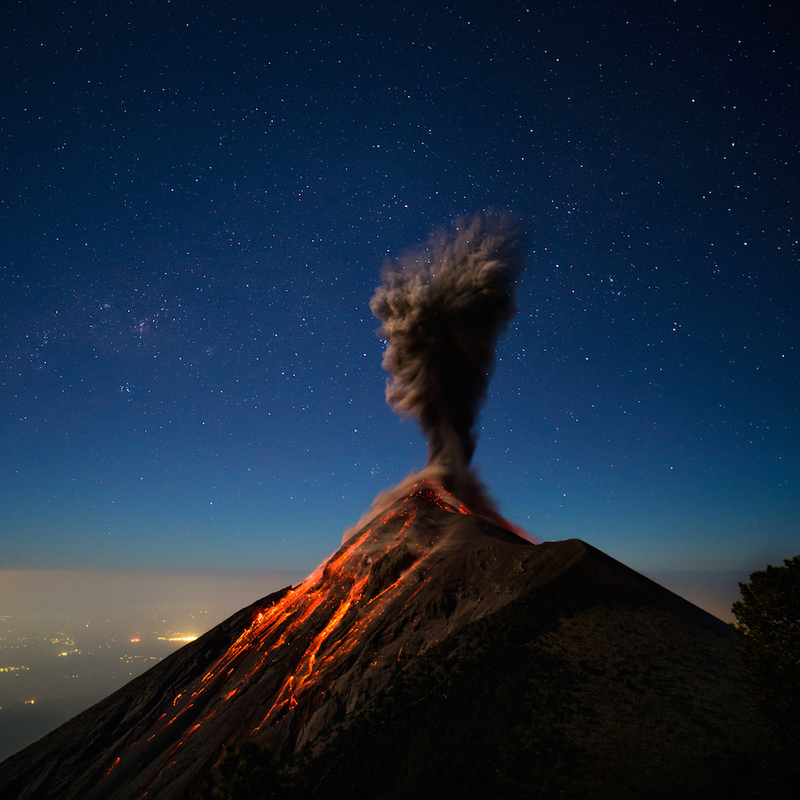 Volcano Fuego is directly adjacent to Volcano Acatenango. 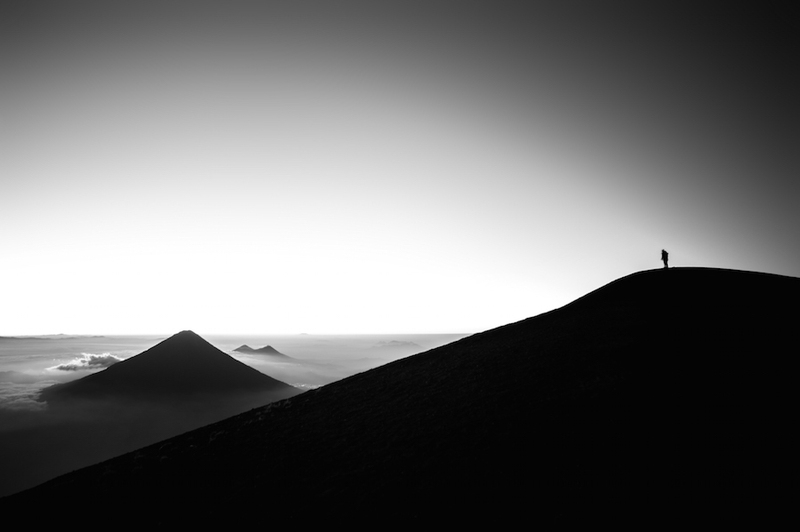 The summit of Acatenango is about 4000m and looks over Fuego’s crater from just a couple of kilometers away. 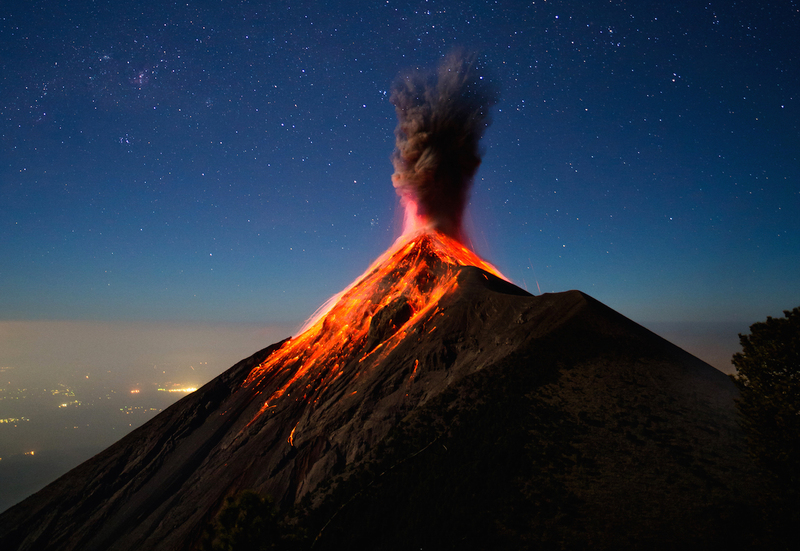 With Fuego’s activity levels, the only non-lethal way of viewing its eruptions is from Acatenango. 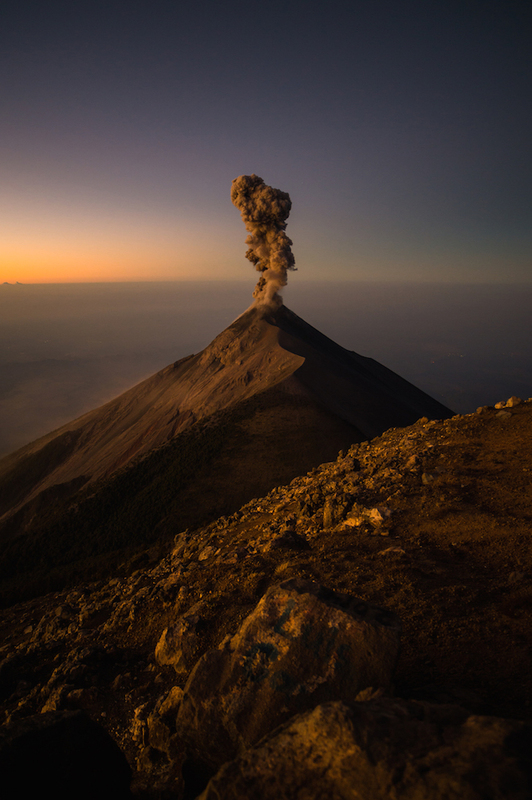 So that’s where our hike would take us for the next 24 hours, to the summit of Acatenango, with the hope that we would witness Fuego in all its beauty and strength. At 11am, and with nearly an extra ten pounds of camera gear in my pack, we slowly made our way up Acatenango pushing through volcanic ash and soil. 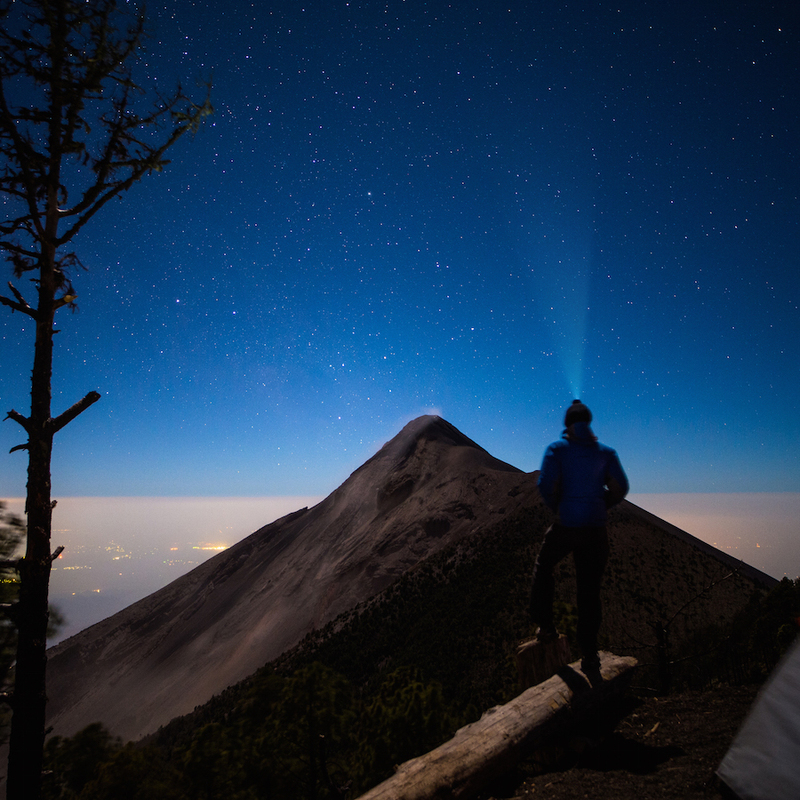 After hiking to 3600m in four hours, my friend, our guide, and I camped near the summit of Acatenango with the view of neighboring Fuego. I pulled out my gear. With me, I had my trusty (and well-loved) gaffer-taped Nikon Df hooked up to my 21mm Zeiss 2.8. I unfolded my Gitzo 1542T tripod. 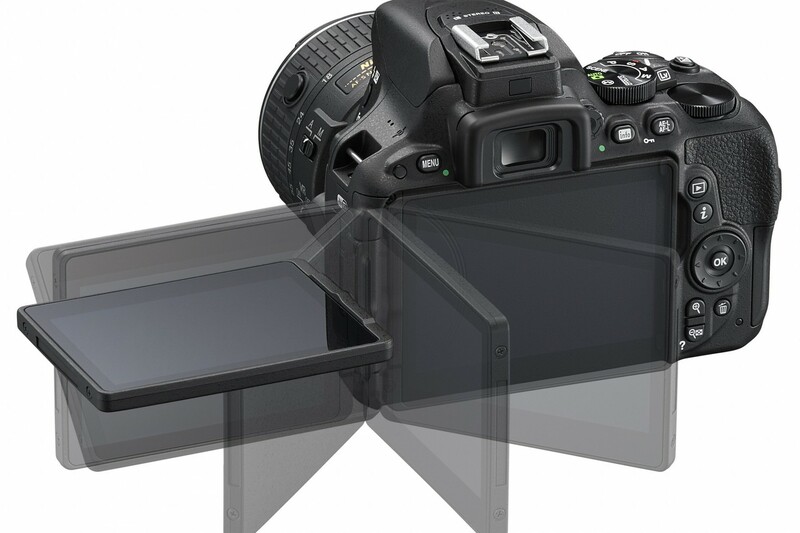 This is the setup I would use to capture Fuego if and when it decided to erupt. I also had with me a Nikon 35mm 1.4, and an old Nikkor 55mm 1.2 in case I needed something tighter. That afternoon we witnessed two eruptions. Mostly smoke and ash plumes, no lava. The brightness of the day was too much to see any of the hot glow of the volcanic rock. Although stunning to behold, these weren’t the images I came for. I wanted lava. I wanted force. I wanted to capture how strong this volcano really was. 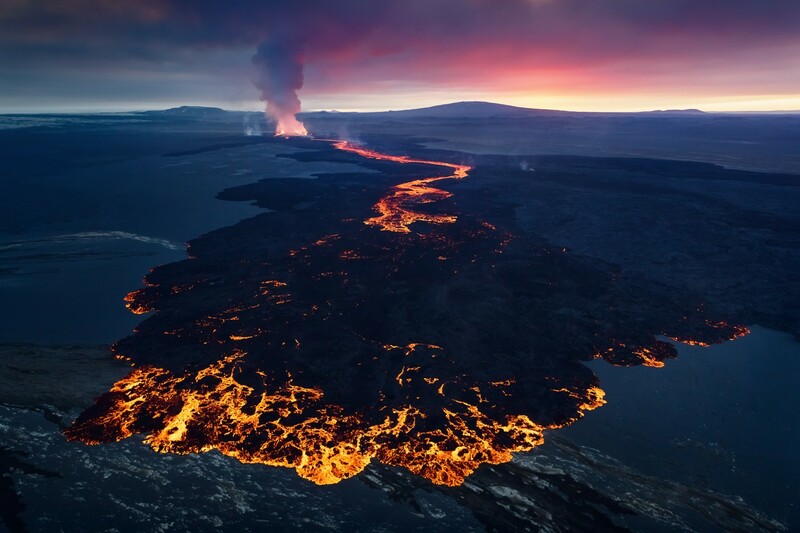 As it got dark, the eruptions seemed to have stopped. By 11:30pm we were all tired and ready for sleep in anticipation for our 4am summit for sunrise. It was cold, windy, and Fuego was calm. Under the nearly full moon, I set my tripod up just outside the tent before we went to sleep. 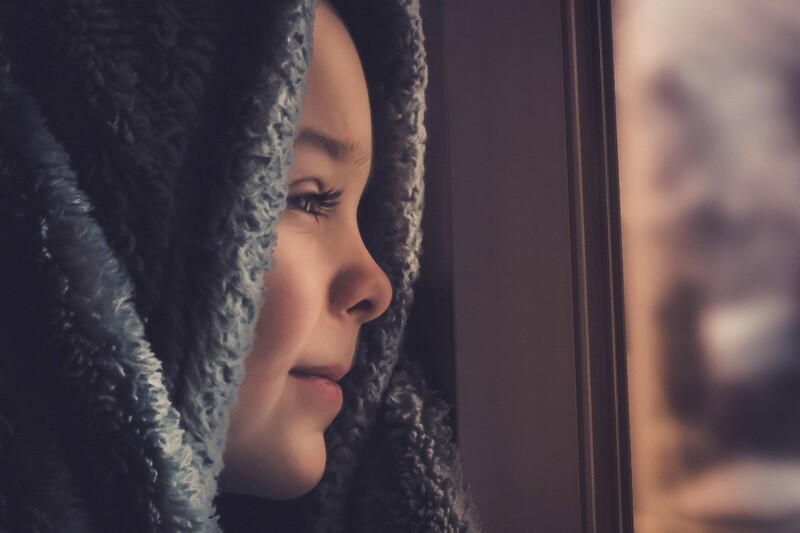 It felt like only moments had passed before we were awoken. Around 1:30am the three of us shot up in our tents to the rumbling of the ground and the sound of a breath-stealing explosion. 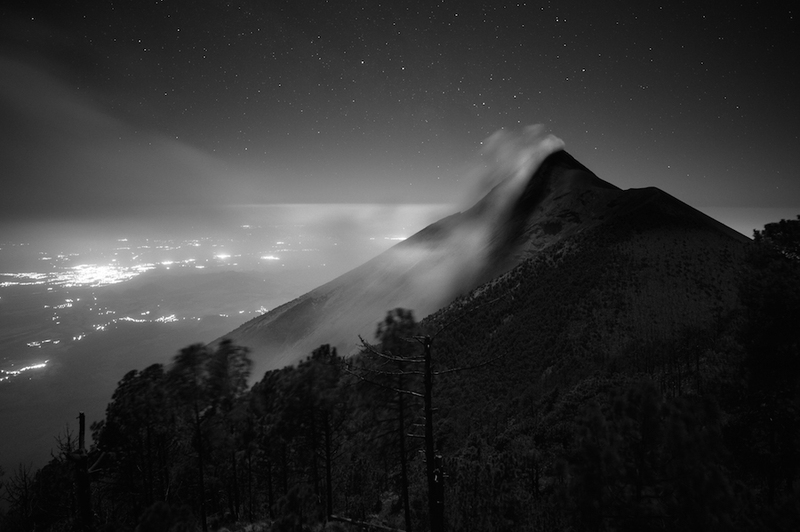 I scrambled to the camera just in time to capture a moonlit and lava-covered Fuego. As beautiful as it is in the images I was able to capture, it was infinitely more gorgeous and humbling in person. 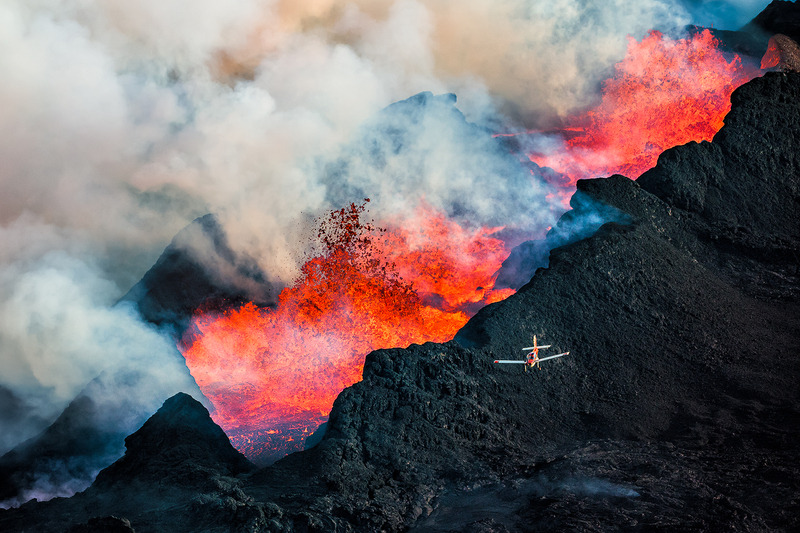 I took as many images as I could with each of the three eruptions we witnessed that night. The moonlight was crucial in capturing the extra details in the ash plumes and giving just enough extra light to bring out some of the deep shadow detail. 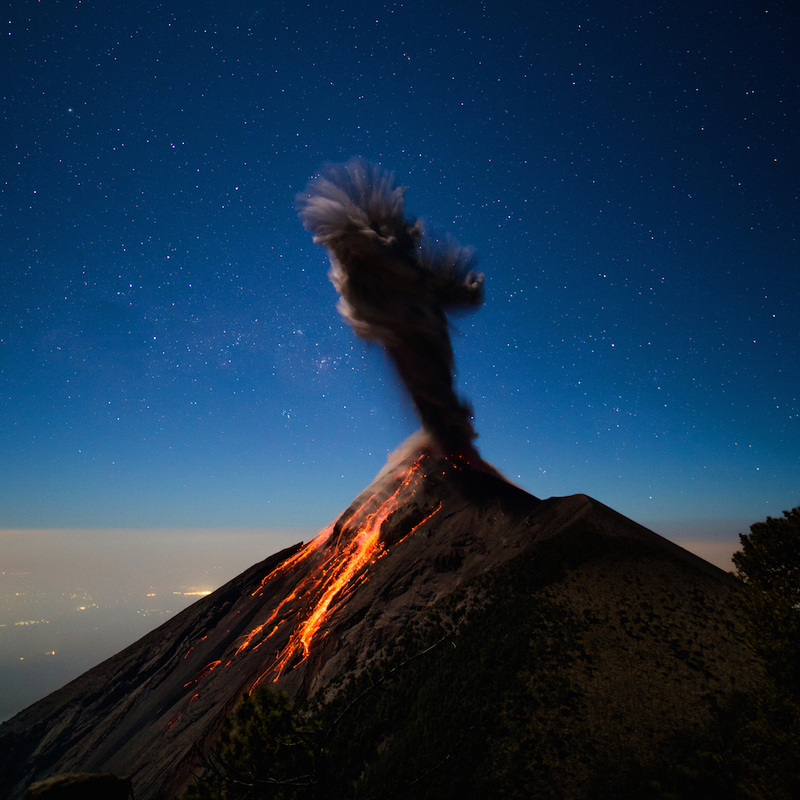 I shot every night eruption image on the Nikon Df at ISO 1600, 21mm f/2.8 for 15 seconds. That seemed to be the sweet spot for getting all the stars in the sky, and light from the distant cities below. I knew that night that I had captured something magical. 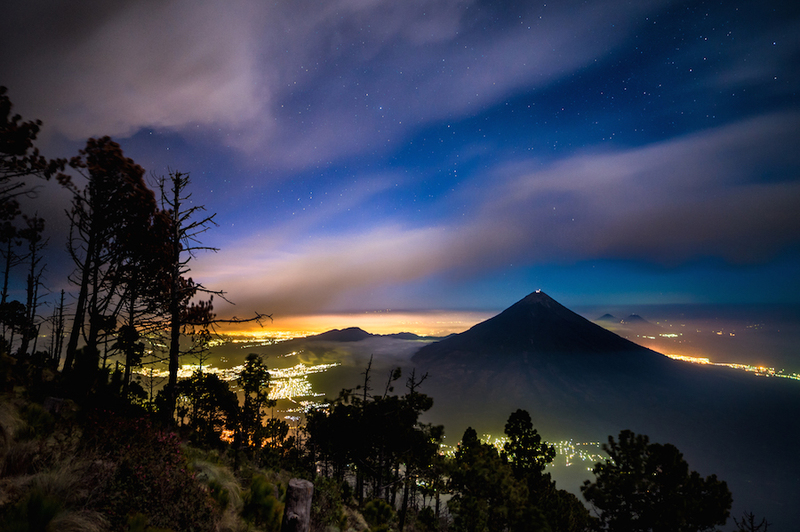 Although it was beautiful to see the volcano at sunrise from 4000m when we summited, it was the lava-filled eruptions of Fuego at night that secured the sense that I had found what I came to photograph.